In January 2017, the U.S. DOT designated U.W.-Madison as one of 10 proving grounds for testing AVs and test projects are underway. 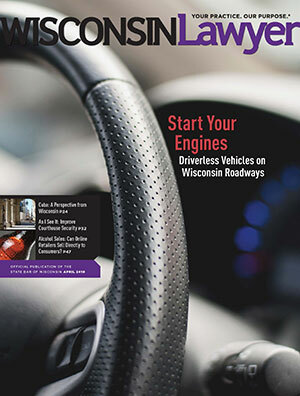 The authors review the federal regulations and recommendations, and analyze areas for opportunities for Wisconsin lawyers resulting from the emergence of AVs on Wisconsin’s roadways. Despite its proximity and long history of complicated interactions with the United States, Cuba still is a stranger to many U.S. citizens. A State Bar-sponsored trip in February helps dispel some of the mystery for a group of Wisconsin lawyers. Reports from counties in which all courthouse visitors are screened prove that dangerous implements are coming to the doors of Wisconsin’s courthouses, and screening inside is interdicting many of those implements. The author urges screening at all courthouse entrances. Chris Rogers says service on a legislative study committee is an important and influential way for lawyers to contribute to the lawmaking process. Being on Twitter has given executive director Larry Martin a pulse on the communities where he lives and work. Bethany Nelson explains any time a client has controlled items, technology, or data, proper measures must be taken to ensure that any foreign persons' access is authorized by law. More clients may be subject to regulation than you might expect. Dean Dietrich says lawyers may not communicate about the subject of their representation with a person known to be represented by another lawyer in the same legal matter. Aaron Gary says a soon-to-be-decided U.S. Supreme Court case may significantly affect Wisconsin’s alcohol distribution system. Deanne Koll suggests we all pinky-swear to give each other permission to enjoy time away without stressing about the work awaiting our return.